How do I know where I need decoupling capacitors? I'm testing it out by breadboarding it while running a simple 'run for 5 seconds then reverse' procedure on the MCU, and I'm experiencing some odd issues with decoupling capacitors. If I leave them off, the motor stutters rather than moving smoothly, presumably due to the motor's power rail dropping. I put a 100uf electrolytic capacitor across it (shown on the board), and it started running smoothly. Now, however, the motor reverses seemingly at random, I presume as the MCU is being reset for one reason or another. Following the 'more capacitance is better' mantra, I installed the second electrolytic cap, between the 5v and ground rails. Now, weirdly, we're back to step 1: the motor stutters. Finally, I added a third, 0.1uf ceramic cap across the motor terminals. Suddenly, everything is fine: The motor runs smoothly, and it reverses when it's supposed to. Adafruit's shield seems to solve the issue by just throwing lots of caps, both electrolytic and ceramic, at the problem. Unfortunately, as you can see, I have quite limited PCB space, so I can't afford to do that. I could take the cargo-cult approach and say "it's working now, great" and stop, but I'd rather understand what it is that caused each of these symptoms, and what I should do to ensure they don't happen on the real board. 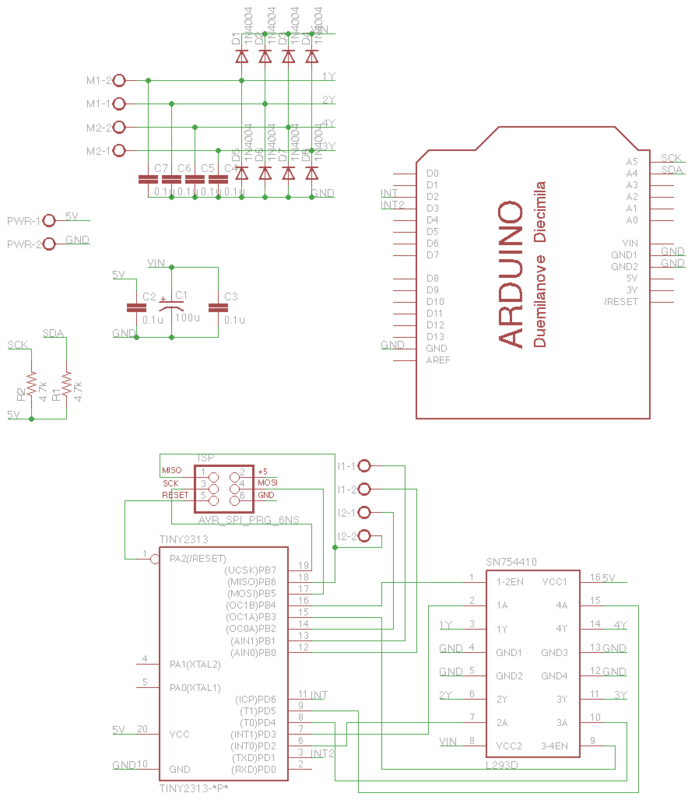 Is the 100u and 0.1u cap between the 5v (logic) rail and ground that Adafruit's shield has necessary? Removing it on my breadboard seems to have no effect. Do I need the 0.1u ceramic caps across both the motor rail on the H-Bridge input and directly across the motor terminals? 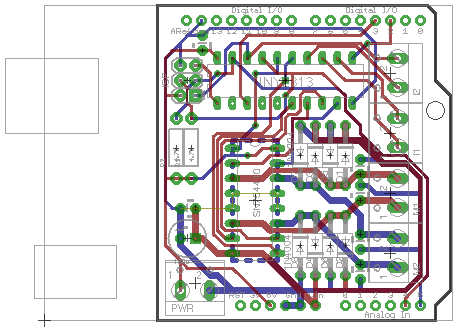 Edit: I've updated the schematic and PCB layout with the proposed positions of caps, based on the advice of those kind enough to answer my question. All digital ICs should have decoupling caps between their power and ground pins. These should be ceramic and physically as close as possible to the IC. You want to minimize the loop length from power pin to cap to ground pin thru the IC and back to the power pin. Decoupling caps deal with short term current spikes the IC draws. They must therefore be high frequency. Large capacitance is not necessary, and since large capacitors usually have poor high frequency response, they are worse. A 100µF electrolytic cap is pretty useless for decoupling. 1µF to 100nF ceramic is good. As for the cap on the motor, the idea is good but I think 100nF is too large. That could cause excessive or unnecessary current to flow in the H bridge every time it switches. If you're only reversing motor direction occasionally, then this isn't a big deal. If you're using the H bridge to modulate the apparent motor drive with PWM, then you should lower the cap. Something like 1nF should still cut down the noise the motor is making while not getting in the way of switching. It's not because removing caps doesn't seem to have any effect that you shouldn't use them. It may work now, but not in an hour or so. Use a bigger and a smaller capacitor. The bigger one will absorb most of the disturbance's energy, but isn't very good at high frequencies, where the smaller one takes over. Is it worthwhile to decouple the same disturbance source twice, over different components? Most likely yes, you can't decouple too much. I remember a colleague's design, where half of the components (about 200) were decoupling capacitors. I'd follow approach with 1 goal: minimize the area for each AC current loop, coupled to power lines (Vcc and ground). Make list of all power nets: say, total 2 entires on list : V+, ground. Split list of this ports (total say ~15) into pairs, by relevance to package with possible duplicates on ground ports or V+ ports. In layout move capacitor closer to ports to reduce the area of loop, formed by 2 leads of capacitor and 2 ports of the pair. Effectively this will shorten the current path to minimize voltage drop, spikes, caused by line inductance and will isolate max(dI/dt) current loops each from other magnetically. Not the answer you're looking for? Browse other questions tagged capacitor motor decoupling-capacitor or ask your own question. Does my circuit need decoupling caps? Is it healthier for a capacitor to be discharged to itself or to “ground”? ATmega328 decoupling caps: are they in right position? Why does Samsung include useless capacitors?